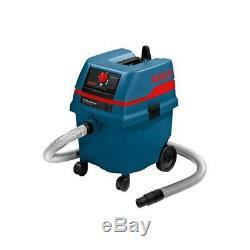 Bosch Wet Dry Vacuum Cleaner All Purpose Industrial Gas 25 L SFC. The description of this item has been automatically translated. Dealer for over 50 years. 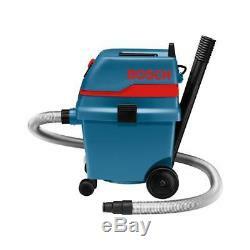 Bosch wet / dry vacuum cleaner all purpose cleaner vacuum cleaner GAS 25 L SFC. 2 x suction tube 0.5 m, 35 mm Ø 2 607 000 162 Crevice nozzle 250 mm 2607000165 Coarse dirt nozzle 2607000170 Luftreguliergriff 2607000164 Multipurpose 1609390478 Paper bag 2605411167 Polyester filter 2607432015 Hose 3 m, Ø 35 mm with tool sleeve 2609390392. Bosch GAS 25 L Vacuum cleaners SFC. The compact vacuum cleaner for mobile use. Easy to clean by semi-automatic filter cleaning system (SFC). Certified Safety vacuum cleaner for dust class "L" to EU standard for good user protection. Easy transportation and loading due to particularly compact design. Extended filter life through Wasserfüllstopp. Complete emptying of the container: no edges - nothing gets stuck. Remote automatic switching for additional operating comfort. Weight 12,7 kg Container volume 25 l Container volume 20 l net Container volume 16 l net water Wet and dry vacuum dust class L Main filter for dust class M Length 440,0 mm Width 376,0 mm Height 482,0 mm Filter surface 4.300 cm ² Maximum flow (turbine) 61 l / sec Max negative pressure (turbine) 248 mbar Max input power (turbine) 1.280 W Functions: Remote automatic switching Semi-automatic filter cleaning (SFC). This applies to all professional blue power tools and measuring tools from Bosch. Except for high-frequency tools, industrial cordless and pneumatic tools, included accessories, as well as battery packs and chargers. All Bosch power tools, pneumatic tools and - measuring tools are carefully checked, tested and subject to strict controls of the Bosch quality assurance. 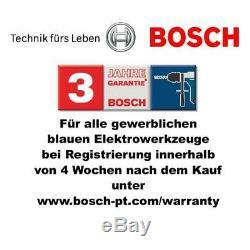 Bosch therefore gives a guarantee for Bosch power tools, pneumatic tools and measuring tools. For these tools is guaranteed in accordance with the following conditions. 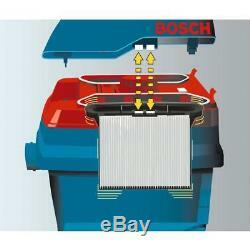 Defects in the tool caused by using accessories, components or spare parts that are not original Bosch parts. Tools in which changes or additions have been made. Minor deviations from the target texture that are irrelevant for the value and usability of the tool. Replaced tools or parts shall become our property. Partially or completely disassembled parts can not be submitted or sent by guarantee. Robert Bosch GmbH Power Tools 70745 Leinfelden - Echterdingen Federal Republic of Germany. You are legally obliged to return of used batteries as the end user. The symbols depicted on the batteries have the following meaning: the symbol of the crossed-out wheeled bin means that the battery not in domestic waste should be given. Pb = battery contains more than 0,004 mass percent lead Cd = battery contains more than 0,002 mass percent cadmium Hg = battery contains more than 0,0005 per cent of mercury. Please note the above instructions. The item "Bosch Wet Dry Vacuum Cleaner All Purpose Industrial Gas 25 L SFC" is in sale since Tuesday, August 8, 2017. This item is in the category "Home, Furniture & DIY\Appliances\Ironing & Vacuuming\Vacuum Cleaners". The seller is "maschinenwelt" and is located in Rietberg. This item can be shipped to European Union member countries.